I'm looking for a hydroponics system (my first). I would like to grow 4-5 plants indoors in my appartment, and be able to grow some food all year around. I would like to grow simple stuff, like some salad, some tomatoes and maybe some chilli. I need to have the system in my kitchen or livingroom, so it would be nice if it looks good. Can hang it on a wall, our just place it on the floor or a table. Do you have any recommendations for me? Re: What is the best hydroponics system for beginners? I've never tried it myself, but good luck with your venture. I've read that hydroponics are tricky and fiddly. Hello. A really good small system for beginners is a DWC bucket - it's really easy, the plant sits in a net bucket lid in clay pebbles, the bottom of the bucket has water with nutrients which is pumped up to a watering ring which sits on top of the clay pebbles with the plant in the middle. We did a Sweet n' Neat tomato plant like this a couple of years ago and we were amazed by the amount of fruit that we got from it, and we always have a chilli plant growing in one of these. However, as you are growing a few items at the same time, I would suggest maybe an NFT kit. The bottom tank holds the water with the nutrients in it, the top tray is slightly sloped so that water is constantly pumped up in to the top tray, runs through the roots and drains back in to the bottom tank. You can cut as many holes as you like in the top membrane and either use net pots and clay pebbles or rock wool cubes as per the photo. Hydroponic systems are brilliant as they are usually self watering, so you can go on holiday without worrying about your plants, you just need to top them up every now and then. The only downside (in my opinion) is as mentioned in another comment is that it is a bit of faff making sure the pH is at the right level and making sure you have measured your nutrients correctly - but some people love doing that sort of thing! Thanks for the advice! I should probably go for the DWC bucket. Looks like it's easier to understand and manage for a first time user. How often do I have to add nutrients and check the pH? I find both DWC drip buckets and DWC bubbler buckets on ebay. What is the differens between those? The DWC drip bucket has a pump which is connected a watering ring, which is placed on top of the media (clay pebbles. rock wool) as per the example photo with the tomato and the bubbleponic bucket has a pump which connects to an air stone in the water, the air stone creates bubbles which gets oxygen to the roots (the water and nutrient level need to be at least 25mm from the bottom of the mesh/net bucket, the roots will grow in to the water. I would recommend changing the water on a weekly basis. I see. Thank you. I will most likely go for the drip bucket. Have been thinking about just starting with one plant, to see how it works out before i scale it. For lettuce, check out the kratky method where you fill up the reservoir to the point that your net cup is barely submerged, and just let it grow. These are all kratky, white bucket in the middle is bush beans, then I have turnip greens and spinach which didn't last. And here are the beans a week or so in the system. Thanks! good thing that you upload pictures. i'm just starting to learn so pictures are very helpful. So the kratky method doesn't require any electricity or pump? What do you think would be the main pros and cons comparing a system like the dwc bucket with the kratky method? jimmyj you mention lettuce and Emma GupH tomatoes. Are the different systems suitable for different things depending on what i want to grow maybe? or is it down to preferences in the end? 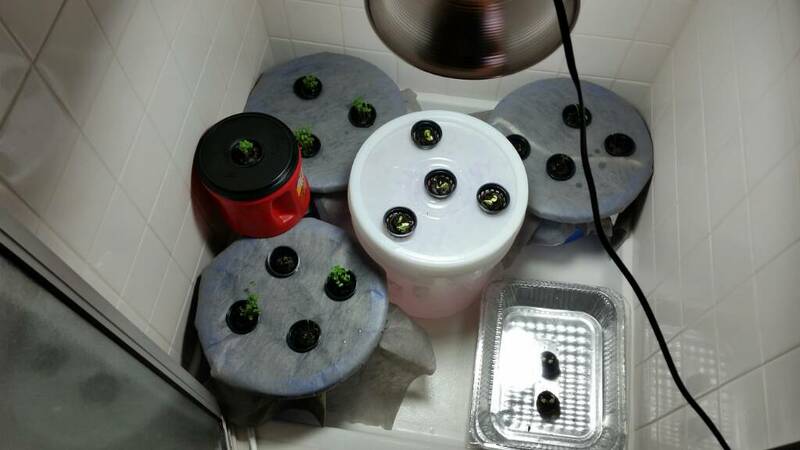 Re: RE: Re: What is the best hydroponics system for beginners? joseph wrote: Thanks! good thing that you upload pictures. i'm just starting to learn so pictures are very helpful. So the kratky method doesn't require any electricity or pump? What do you think would be the main pros and cons comparing a system like the dwc bucket with the kratky method? jimmyj you mention lettuce and Emma GupH tomatoes. Are the different systems suitable for different things depending on what i want to grow maybe? or is it down to preferences in the end? Yes, kratky is pumpless. From what I've read and watched online for the kratky method, most people use it for non-fruiting plants such as lettuce. The reason being with the shorter grow time you fill the reservoir and by the time the plant has sucked up all the water, it's ready to be harvested. With fruiting/longer lasting plants, nutrients need to be replenished but if you fill it back up you can drown the plant. Here is a good intro video to the method. I tried the static Kratky method with over 25 plants within a plastic covered green house. 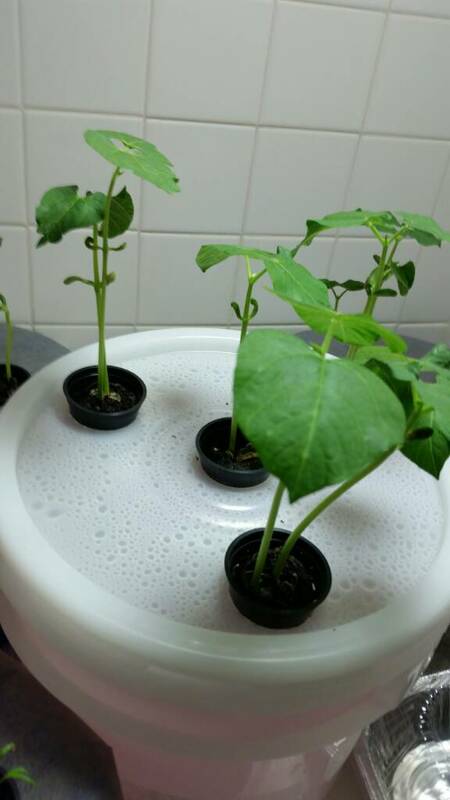 Multiple plants in a single trough, fluid content 40 gallons, number of plants, 16. I used mc Donald's plastic cups in 3 inch hole, I punched/drilled holes in the bottom of the cup. No air supply given. Great results, plenty of fruit, good tasting. The type of tomatoes was supposed to be brandywine but did not achieve the expected bulk, they reached 8 ounces, not huge but big enough. I tried heirloom variation black seaman with just as good results as to production. As for the cherry variety, they were very productive. There is a very slight difference in the taste with the hydroponics slightly less in taste. I believe the loss is due to lack of "minerals" within the hydroponic solution. The Kratky system suffered dark, slick root rot at the end of the season loosing the last part of the harvest. I removed and salvaged the fruit to rest in the window and Finnish ripening.